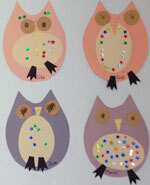 Our Owls Pre-K classroom is designed for 4 year olds. The student to teacher ratio does not exceed 10 children to 2 teachers. The class attends chapel with the St. Mark Pastor every Tuesday morning. Then throughout the year special field trips are planned to enrich learning. The children enter this class with some of the skills needed to start kindergarten in a public, private or charter school, but with the guidance of our teachers, they will be completely ready by the end of their pre-K year! A look into the Owl classroom will reveal a more traditional classroom. It is full of developmental, focused centers, which changes throughout the week. There are also more opportunities for dramatic play which the children enjoyed in the younger classes. Upon arrival in the morning, you’ll see the pre-K teacher sitting around a table with a group of children working on pre-reading, writing, early math, science skills, or an art project in a very small group. The other children are enjoying free play with games, puzzles, blocks, LEGO, or dramatic-play toys. After a certain amount of time, the group rotates. This ensures all students will receive individual attention. We’ve found this educational-directed approach to be a success! With Show-and-Tell each class day the children practice positive communication. After the speaker’s presentation, the listeners ask questions. With a degreed and experienced teacher, our students master correct pencil grip and will learn to write their names. The teacher also provides many activities that develop pre-reading skills. This will be evident when your child begins kindergarten and starts to read. The love of discovery is instilled within each unit of science and math. To celebrate the year’s success our students graduate! We have a formal, but kid-friendly ceremony complete with caps and gowns.